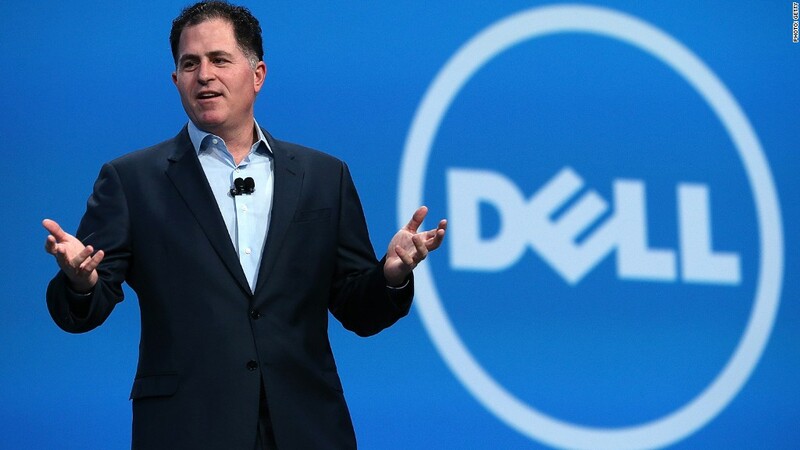 Michael Dell is loving life a year after taking his namesake company private. He doesn't miss dealing with short-sighted investors, nitpicking analysts and tedious regulators. Being a private company allows Dell to take a much longer strategic view. The tech firm is making costly investments that may hurt quarterly results, but could pay off big time in high growth areas like cyber security and cloud computing. "I feel absolutely great, even more convinced it was the right thing to do," the billionaire CEO told a packed crowd at the Council on Foreign Relations in New York on Wednesday evening. "We're gaining share, we're growing. That's a lot more fun than what we were doing before," he said. Buying back his company: Late last year, Dell teamed up with private equity firm Silver Lake to purchase the company he founded in his 1984 dorm room for about $25 billion. Now the CEO owns roughly 75% of the business. He admits the drawn-out sale process created uncertainty for employees and customers. "There were some pretty dark moments," Dell said. Asked why he took the risk of buying it back, he said: "Why not? What else are you going to do?" That drew laughs from the audience and a knowing look from the moderator, Bloomberg LP CEO Daniel Doctoroff. "I'm familiar with guys who didn't know what else to do," joked Doctoroff, who recently announced plans to cede the top job at Bloomberg back to founder Michael Bloomberg. All eyes on the future: Dell explained how his company experienced a "negative feedback loop" while trying to reinvent itself as a public company. Short-term focused investors were spooked by Dell's attempt to go from selling products to offering IT services and solutions. "The stock would go down. That wears on people. It's pretty difficult," he said. While he still believes there's "an important role" for the stock market, Dell laments how regulations like Sarbanes-Oxley have forced boards to spend more and more time on "backward-looking activities." As a private company, Dell gets to skip a lot of those disclosure requirements. That's why it's hard to say precisely how the company is doing. But there are signs it's growing after sputtering the past few years. According to research firm IDC, Dell enjoyed a 6% jump in PC shipments in the most recent quarter despite a decline in the overall industry. That's one of the reasons why Bloomberg News recently reported Dell and Silver Lake are sitting on paper gains of at least 90% on their initial investment. Of course, Silver Lake is eventually going to want to cash in those gains -- possibly through an IPO. But Dell doesn't sound like he's in a rush to bring his company public again. "We'll figure that out," he said.